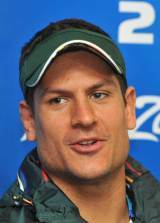 Pierre Spies is a South Africa No.8 who was part of the Springboks side that beat the British & Irish Lions in 2009. He plays for the Bulls and received recognition as a youngster in 2006 when he won the Newcomer of the Year award from the International Rugby Players Association. Spies has incredible pace for a back-row forward and used to be a wing when he played for the Springboks Under-19 side. One of the reasons Spies is so quick and powerful is due to his training regime and immense physical attributes. His teammates often watch in awe at his bench-pressing prowess and he can vertically jump 1.4 metres as well as having supreme leg strength to boost his incredible pace. He burst onto the scene in 2006 in the Tri-Nations when he turned in two man of the match performances but he suffered a major setback the following year. He started to cough up blood and was ruled out of South Africa's World Cup squad after blood clots were found in his lungs. The Springboks won in his absence but a year later he marked his return to the national side with a try against Wales in Bloemfontein. In 2009 he played an integral part in the Bulls run to the Super 14 title, showing his scorching pace with breakaway tries in both the 36-23 semi final win over reigning champions the Crusaders and the 61-17 destruction of the Chiefs in the final at Loftus Versfeld. He was picked in the South Africa squad to play the British & Irish Lions and he started both the first and second Test, which the Springboks won to claim the series. In the third Test he came on as a replacement for Jongi Nokwe on the wing, once again showing his unbelievable pace for a No.8.